In America, apparently, there’s a church called the ‘Scum of the Earth Church’. There’s also a bikers’ church and a rappers’ Bible. Whoever you are, whatever your background, socio-economic group or interests, there’s a church out there for you. I was at a lecture last night given by John Micklethwait. 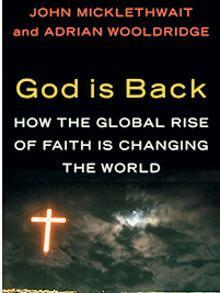 He’s the editor of The Economist and co-authored a book last year entitled God is Back, on which the lecture was based. His central thesis is that, contrary to the predictions of sociologists in the mid-20th Century, religion is not dying out but is actually experiencing a global resurgence. Anyone who did foresee that people would continue to seek God said it would be restricted to pockets of a highly intellectual, academic nature (‘Graham-Greene-ish Catholicism’ in Micklethwait’s words) or the poorer, lower-class, disenfranchised end of the social spectrum. In fact, though, the authors’ research for the book showed them that although both these trends do exist, in the US at least, the booming Christian churches are attracting very successful, affluent, middle-class, suburban families. Micklethwait also spoke of a house church in China which was full of successful business-persons, not the rural poor seeking an ‘opiate’ to take their minds off a harsh reality for a few hours each week. Micklethwait, as a good economist, characterised this in supply-and-demand terms, suggesting that in giving people a sense of worth and meaning, the church was meeting a felt need among people. He stated that many people have faith for the pragmatic reason that it is healthier, wealthier and wiser to do so than not. Journalist Cristina Odone, in her response to the lecture, took issue with this ‘supply and demand’ narrative, saying that faith is not something that can be measured in economic terms, but I think his thesis is right, just slightly off on the analysis. 2. People yearning to connect their mundane lives to the beyond. I wonder whether this is a partial description of what the writer of Ecclesiastes meant when he said “He has also set eternity in the hearts of men” (3:11). God has placed in us something (a soul?) that knows it was created to be part of something bigger, something more than work-eat-sleep. Churches reinvent the packaging, fitting the style of music, the decoration and layout of the sanctuary, and even the language of the liturgy to the audience. But as long as they are neither diluting nor distorting the core message of the gospel, these are only the equivalent of speaking in another language. Why preach in English if your listeners are French? God, or rather, faith in Him, is back. Modernity promised so much, but in the end it has been revealed as yet another empty idol – a shiny trinket that promises much but delivers disappointingly little. God seems to promise nothing in this life except hardship, self-denial and persecution (to a greater or lesser extent, depending on your location), but millions of people all over the world have ‘tasted and seen that the Lord is good.’ (Psalm 34:8) He promises life, and supplies it in all its fullness. Great reminder (from Paul in that chapter) that Christians aren’t meant to lord it over others as if we’ve somehow arrived – we’re all still broken and sinful. There’s a line in a worship song that I love: ‘broken but singing’. we’re sinful, but somehow loved by the creator of the universe! How amazing is that? And what a gift to offer to those around us who have been made to feel like scum. Fabulous! PS Funny, your second comment went into my spam folder! I spotted the typo in the web address and corrected it though.